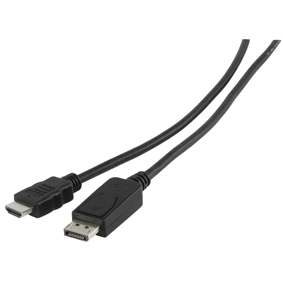 This cable converts DisplayPort signals to HDMI signals. Ideal to connect DisplayPort devices to your HD TV. DisplayPort is much smaller than its predecessor, the VGA connection. This new, slimmer size is extremly thin and perfect for mobile and handheld devices. Serveral large manufactures have now stated that they plan on including the DisplayPort connection in many of their devices.